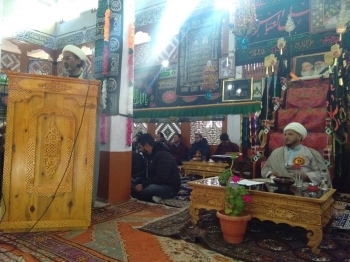 Eid-ul Milad-Un-Nabi, Birth Anniversary of Prophet Mohammad was celebrated with religious fervor on November 26 at Imam Bargha, Chuchot Yokma. Hojatul-Islam-wal-Muslimin Sheikh Nazir Ahmed Sharifi, President, Majeless Ulema was the chief guest. He spoke about the importance of the occasion and urged people to adhere to the footsteps of Prophet Mohammad. Birth anniversary of the Prophet Hazrat Mohammad Mustafa (PUBH) is celebrated as Hafta-e-wahdat (week of unity) from 12 to 17th of Rabbi-u-awwal, 1440H as per the Islamic calendar throughout the world. Ashraf Ali Barcha, President, Anjuman Imamia, Leh said, “We are celebrating peace and when the same prevails among all communities then we could accomplish it in the entire world. Unfortunately, there is a lack of unity and peace owing to which we witness adverse effects. Every individual is different. There are few who create disturbances in the society and make people fight with each other for their own self-interest”. Sheikh Abdul Qasim Matuhari, Hojatul-Islam-wal-Muslimin, Hafiz Noor-ul Hassan Nadvi, Moin-ul-Islam, Ahmed Sharif, President, Majelwss Ulema also shared their views and emphasised to create harmony and brotherhood among every community. Students from Imamia Mission School Chuchot, Imamia Model School, Leh, and Al Hadi Boys Hostel also took part in the occasion. Later, prizes were distributed to the toppers in exams, competitive exams qualifiers and person having outstanding performance in co-curricular activities.